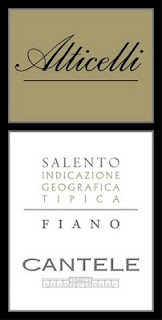 Donato (from VIAS Imports Ltd.) came to the store with 6 wines: 3 whites and 3 reds. I like the guy: nice, easy, gentle, courteous, respectful, polite, understanding and somewhat reserved, or humble should I say, a good guy to have around with rare qualities compared to many other salesman out there. Super light, very clean, almost watery, pale yellow color with greenish reflects. The nose is clean, fresh, lemony, green apple aromas with mineral, white flowers and white unripe peach notes. A bit steely. The palate is also very clean and bright, almost too light, with flavors of green apple, lime, lemon zest, white fruit and mineral notes. The finish is very dry, crisp, bright, slightly green with white pepper sensation due to the acidity and (again) a touch steely... Overall, not bad but too light (for my palate and in my opinion) with not enough stuffing and way too dry in the finish.. I'm not so sure if steely is the right word, but it is the one that came to my mind while I was tasting the wine. Ok not great, too dry may be and too light. In the glass, it exposes a light, pale yellow color with slight golden reflects. The nose expresses aromas of unripe yellow apple, white peach, somewhat restrain or not as expressive at first, but opening nicely after a couple of minutes in the glass. The palate is definitely crispier than the usual Fiano (di Avellino) from Campania, which is weird because this wine come from Puglia which normally makes richer, riper wines. Although, the only explication is that the Salento peninsula which represents the south-eastern extremity of Puglia, is a rock of limestone dividing the Adriatic from the Ionian Sea, known also as "peninsula salentina", with slightly cooler climate than the inland part of Puglia. The different seas associated with the limestone soils providing a more temperate climate, slightly cooler terroir therefore fresher whites but also reds wines. The palate is very bright, with great acidity and nice balance, with a citrusy, limey enjoyable finish. Nice and fresh, clean and very agreeable, not as rounded as a Fiano (di avellino) but still expands nicely with the characteristic way of coating the palate of the Fiano grape. Behind its light yellow color with pale golden reflects, the 2008 Gougenheim Torrontès reveals a very attractive nose combining aromas of ripe white peach, apricot, melon in a clean, fresh and inviting way. The palate shows very good balance overall with clean white and orange fruit flavors, refreshing acidity and mineral touch, with a crisp, dry finish. Lovely, not the most complex yet well made and very enjoyable. It will be a great everyday sipper as an aperitif. Light, clean ruby color, quite attractive in the glass. Nice aspect. The expressive, fruity nose offering aromas of ripe red and dark cherry, violet and other floral hints is quite fragrant and inviting. 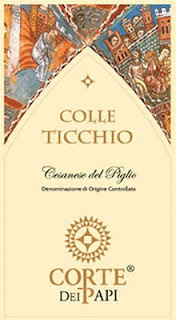 After the great, juicy, fruity attack, the mid-palate develops flavors of ripe dark and red cherry intermingled with spices, lifted by high acidity but unfortunately finishes with green tannins, touch vegetal, slight bitterness. Overall ok, yet there are 2 schools for this kind of situation: or like it and you think that the tannins are part of the classical taste for this traditional Chianti Colli Senesi and that it is surely food friendly and the tannins will dissipate with the food; or you dislike it, because of the green tannins and think that even the food will not hide anything. Well, you will be the only judge of that. All I can say is that for the price, it isn't bad but it enter a price range where one can find slightly better. Made from the nearly instinct grape variety Cesanese del Piglio (Piglio is a village in the Province of Frosinone, region of Lazio, located about 50 km east of Rome), never really used since the 18th century yet recently replanted and revived in the region of Lazio, this wine was a nice little surprise in this little tasting, quite light and unusual, but nice overall. In the glass, the color is bright ruby red, with good intensity. Very fragrant with earthy notes, the nose displays bright red berry aromas with mineral, violet and earthy spicy hints. After a great juicy attack, the light and earthy palate combined Terroir oriented, slightly rustic red "dirty" cherry flavors. The mid-palate has high acidity and slight esoteric, rustic and earthy notes. The overall wine profile is light and dry with a lot of spices, earth and pepper. Somewhat usual, definitely not your everyday wine yet quite interesting in my opinion. Perfect for the mid-season like Fall, with aromatic and flavorful grilled or baked red meat, venison, wild boar. 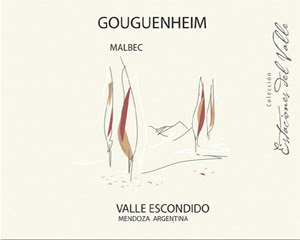 Gougenheim has always been a standard and a benchmark amongst all the Malbec(s) that we have on the shelves. Quite dark and intense in the glass, this wine is pretty good, generous, ripe, opulent and earthy, with sweet tannins. Only hiccup: a slight touch of alcohol in the back palate yet nothing disturbing. Not as polished as the 2007 vintage which was great, especially for the price, and not a fresh as the 2006 vintage which had a bit more acidity, but overall, this juicy, meaty wine will please the amateurs of Malbec and rich wines in general. The Fall-Wintery profile of this wine makes it perfect for grilled meat and BBQ, ideal for a warm Indian summer.